Clarksville, TN – Start out the new year with a delightful romp through the world of a coterie of animals which have captivated young and old alike for over a century. The tales of beloved author and illustrator Beatrix Potter take center stage at the Roxy Regional Theatre in “Flopsy, Mopsy & Cottontail” for four consecutive Saturday afternoons, January 17th – February 7th. Join Peter Rabbit, Flopsy, Mopsy and Cottontail, when they meet Mr. McGregor, Jemima Puddle-Duck, Samuel Whiskers, Mrs. Tiggy-Winkle and Mittens, Moppet and Tom Kitten, all in this wonderful, colorful revival of the Beatrix Potter classics. 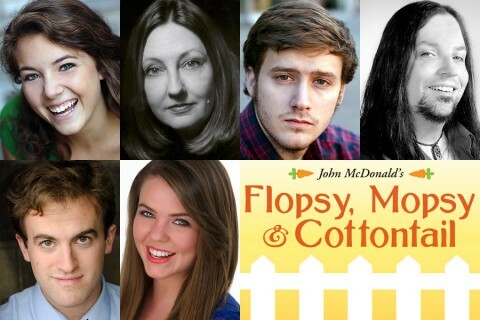 Flopsy, Mopsy & Cottontail features (Top L to R) Corinne Bupp, Leslie Greene, Eli Jolley, Ryan Leyhue, Mark Sherlock and Kristina Wilson. This collection of six stories, adapted for the stage and directed by John McDonald, features Corinne Bupp, Leslie Greene, Eli Jolley, Ryan Leyhue, Mark Sherlock and Kristina Wilson. Performances are at 2:00pm on January 17th, 24th, 31st and February 7th. Tickets are $20.00 (adults) and $15.00 (ages 13 and under) and may be purchased online at www.roxyregionaltheatre.org or by phone at 931.645.7699, or at the theatre during regular box office hours (9:00am to 2:00pm, Monday through Friday, and one hour prior to curtain).